Spain’s Prime Minister Pedro Sánchez has said his minority Socialist (PSOE) government will refer its 2019 budget to parliament for approval in January, possibly triggering early elections if it is rejected. The Socialists control just 84 seats in the 350-seat parliament, the smallest proportion for a government since the country returned to democracy following dictator Francisco Franco’s death in 1975. To pass the budget they will need the support of the Catalan pro-independence groups who have so far steadfastly refused. ‘The cabinet will approve the budget proposal in January and we will then present it to parliament’ later the same month. ‘We will work until then to get support in parliament’ for it to pass, Pedro Sánchez told private television channel Telecinco. Asked if he would call snap polls if the budget is rejected by parliament, the prime minister said only he would ‘fight’ for the budget to be approved. Sánchez took over in June from the conservative Mariano Rajoy after a surprise no-confidence vote which was supported by Catalan pro-independence parties. But the Catalan groups are now angry that public prosecutors in November sought jail terms of up to 25 years on charges of rebellion or misuse of public funds for Catalan leaders in jail over last year’s failed attempt by Catalonia to break away from Spain – and they are refusing to cooperate with Sánchez’s government. Sánchez’s Socialists suffered heavy losses in a regional election in Andalusia on Sunday which also saw a far-right party, Vox, win seats in a regional parliament for the first time since Spain returned to democracy. 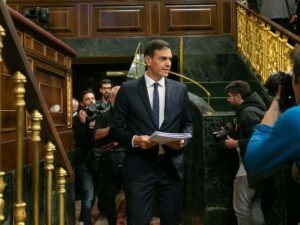 Asked about the polls, Sánchez accused the conservative People’s Party (PP) and centre-right Ciudadanos (Cs) of considering ‘without shame’ joining forces with Vox to govern in Andalusia, which has been ruled by the Socialists for 36 years.